2. Process 2 cups of the pecans in a food processor, until finely ground. 3. Add sugar and butter to pecans, mix well. 4. Press the pecan mixture into a 9-inch pie plate. 5. Bake until lightly browned, about 10-12 minutes. Cool the piecrust. 6. Microwave the caramels and 1/3 cup whipping cream for 3 minutes on High, stirring after each minutes. 7. 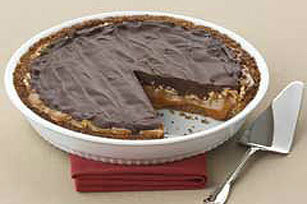 Pour the caramel whipping cream mixture into piecrust. 8. Chop the remaining pecans into tiny pieces and sprinkle over the pie. 9. In small saucepan, over low heat, stir chocolate, remaining whipped cream, powdered sugar, and vanilla until chocolate melts and mixture is a smooth consistency. 10. Spread chocolate mixture over top of pie. 11. Refrigerate at least 2 hours.